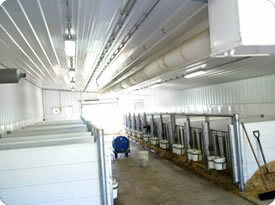 Providing fresh air makeup is crucial for a healthy environment for young stock. 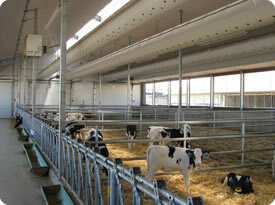 This is often an ambiguous task in calf barns as drafts can be equally problematic for the health of the calves. An effective solution is to introduce sufficient fresh air from outside using a poly tube with small holes distributed appropriately along the length and around the circumference of the tube which is inflated by a fan. This will jet the air in many locations evenly and effectively throughout the barn.